Translation notes: I wasn’t really around much at the time, but @reika has also commentated about Fuji TV’s shenanigans during last year’s broadcast. Miyane Seiji is mentioned — he was one of Fuji TV’s announcers during the commentary segments. Tokumitsu-san: he is the main announcer at each year’s election. 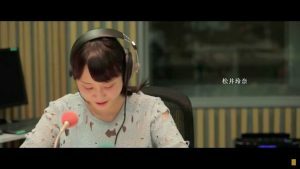 Sean K is a Japanese “talent” popular in radio and narration. … my oshimen’s commentary was not even shown, and there was nothing but commercials! They really went to the very last second. I’m looking forward to the way that Miyane Seiji always talks like he knows everything. I don’t think Tokumitsu’s question are necessary. That’s why member’s couldn’t say what they wanted to say, and they just blamed it on lack of time. I don’t really think the questions were meant to bring out anything meaningful. They were probably trying to adjust the timing, but even though the speech is done, it’s a waste of time, huh. I don’t care if they broadcast the concert, but at least they should make it so you have to visit in person for the election. The speeches for the really top members got shortened as time went one. They probably won’t even broadcast it this year. Maybe they’ll have Kojiharu come back to Tokyo as a guest. It’s almost unlikely that they’ll broadcast it, right? I don’t know about the full broadcast, but it seems other people in this world have slowly lost interest in AKB. It’s scary. Doesn’t matter about the time; as long as it still gets double-digit ratings, they’ll still broadcast. They should at least broadcast it on BS Sukapaa. Fuji TV’s guests were boring. When I think about the guests that that don’t appear on Fuji TV or Yukari TV, shaking their heads, and having to watch them, it really pisses me off. This year’s flower girl will be Takamina. Please broadcast this without any commentary. PLEASE! I watched it last year without visual. I just listened to it audio-only. They shouldn’t waste so much money just to set up a studio for commentary. They should just have Takamina, Miyane, and Shinobu-chan there as guests. Tokumitsu’s questsion were like 90% not related to what was said in the speeches. It’s really not needed. They should do it like Sun TV’s baseball: show the entire thing uncut, without any unnecessary clutter. Tokumitsu messed up a lot. He even got Akicha’s name wrong. They put the speeches in a little box in the corner, while they focused on the old man commentary, didn’t they. Just the Janken tournaments, the elections are not really suited for live TV. Seriously, they should ask the person who did the MC for the Draft Meeting. That was so intense, I loved it. They do that a lot during sports, imitating variety shows, with the little box they put in the corner. But no amount of commentary will ever be more important than the event itself. While they can still get ratings, I wish they’d broadcast it, and make good use of the time, right? To make it easier to understand for “normal” people, maybe have a 20 second intro, and then Shinobu or Takamina do the commentary. If they broadcast it during a peak time, their expenses will increase. Then they’ll wrongly rely on more guests appearances. I don’t care if they stop broadcasting on Fuji TV. I really wish they would stop actually. If they had a second audio that muted the commentary, that would be great. I remember last year they didn’t even have time for an ending after Sasshi’s speech, unlike the year before that. The “Muto” tragedy. At #12, with Milky, her professional instincts really shined. If they broadcast it somewhere else, they should do GYAO, hulu, TV Asahi, LINE, or something like that. For everyone not in the Kami-7, the limit should be 2 minutes! Don’t talk for 10 minutes if you’re not even in the senbatsu lineup! Two years ago, didn’t they take some footage backstage during some segments? They didn’t even care about the upper ranks when the time came. They really spent a looot of time on the people at the bottom, and they top three didn’t even have time to make their speeches. It’s so dumb, making me angry. It was so funny watching Shimazaki looking over the other SKE members. If they do a general TV broadcast, they want ratings, so they’ll forbid any other kinds of broadcast of premium channels. So don’t depend on that. I feel like the members in upper ranks try too hard to say things that are dramatic and long. I really like the lower rank’s speeches because they are more honest in expressing thanks to the fans. The comments were really funny though lol. Even my brother, who is not a fan laughed at how the people reacted to the CMs. I stayed up so long last year, but worth it. I also had a lot of trouble with the streams so they’d cut out every so often.